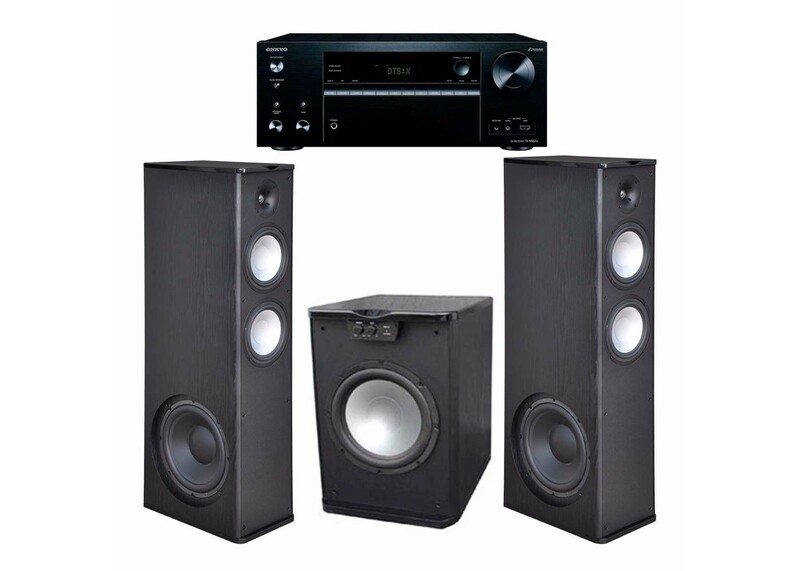 You Will Receive: 2 Premier Acoustic PA 8.12 Tower Speakers with 1PA-150 Subwoofer and Onkyo TX-NR676 ReceiverPremier Acoustic PA8.12 - A floor standing speaker is designed to bring out a wide range of sounds whether they are being used for a DVD experience or just plain old rock and roll. We have incorporated dual 8-inch long throw polygraphite woofers to deliver subtle but pounding bass as low as 35 HZ. The tweeter is the clearest tweeter available for home speakers. Thrilling highs can be produced as high up as the human ear can hear. We feel PA-8F is one of the best sounding speakers on the market today. Both the top and bottom of the cabinet are also custom finished in a high gloss piano black lacquer. Not only does this speaker sound the best in its class, it will bring style to any room in your home. are designed to bring out the low end bass response found in DVD movies or music. Huge explosions dinosaurs walking or just bass guitar and drums the PA-150 SUB is designed to reproduce these sounds perfectly. The alignment of a large 15-inch polygraphite woofer Rear port design and a built in 1000 watt peak amp makes this sub fill any room with powerful clear pounding bass. We have given you even more control over the way you tune your subwoofer. An adjustable crossover to custom set the frequency response a volume control to set the output and an auto on/off switch to power on the PA- 150 SUB as soon as that bass hits your sound track. All these features make the PA-150 Sub one of the strongest powered subwoofers on the market today. Onkyo TX-NR676 7.2 Channel AV Network Receiver:This thoroughbred A/V receiver streamlines access to app-based music, on-demand TV, games, and more. Linking your 4KTV and up to seven media players over HDMI, the TX-NR676 processes all the popular Hi-Res and object-based audio codecs while Dynamic Audio Amplification reproduces sound flawlessly for an adrenalin-pumping theater experience. Future-focused, the receiver plays almost any audio accessible to your mobile device or PC over dual-band Wi-Fi, and comes with Chromecast built-in and DTS Play-Fi, which make mirroring music a one-tap operation.